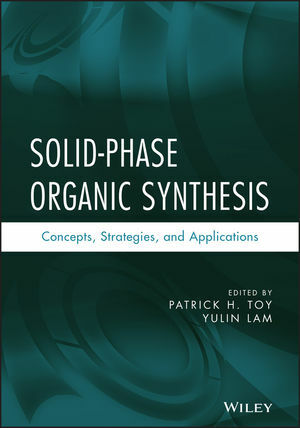 With its emphasis on basic concepts, Solid-Phase Organic Synthesis guides readers through all the steps needed to design and perform successful solid-phase organic syntheses. The authors focus on the fundamentals of heterogeneous supports in the synthesis of organic molecules, explaining the use of a solid material to facilitate organic synthesis. This comprehensive text not only presents the fundamentals, but also reviews the most recent research findings and applications, offering readers everything needed to conduct their own state-of-the-art science experiments. Part One, Concepts and Strategies, discusses the linker groups used to attach the synthesis substrate to the solid support, colorimetric tests to identify the presence of functional groups, combinatorial synthesis, and diversity-oriented synthesis. Readers will discover how solid-phase synthesis is currently used to facilitate the discovery of new molecular functionality. The final chapter discusses how using a support can change or increase reaction selectivity. Part Two, Applications, presents examples of the solid-phase synthesis of various classes of organic molecules. Chapters explore general asymmetric synthesis on a support, strategies for heterocyclic synthesis, and synthesis of radioactive organic molecules, dyes, dendrimers, and oligosaccharides. Each chapter ends with a set of conclusions that underscore the key concepts and methods. References in each chapter enable readers to investigate any topic in greater depth. With its presentation of basic concepts as well as recent findings and applications, Solid-Phase Organic Synthesis is the ideal starting point for students and researchers in organic, medicinal, and combinatorial chemistry who want to take full advantage of current solid-phase synthesis techniques. PATRICK H. TOY, PHD, is an Associate Professor in the Department of Chemistry at the University of Hong Kong, where he was recognized as an Outstanding Young Researcher. Dr. Toy's review of the Mitsunobu reaction is one of the most frequently downloaded articles ever published in Chemistry-An Asian Journal. YULIN LAM, PHD, is an Associate Professor in the Department of Chemistry at the National University of Singapore. Dr. Lam is a reviewer for several major journals and is an Editorial Advisory Board member of ACS Combinatorial Science.